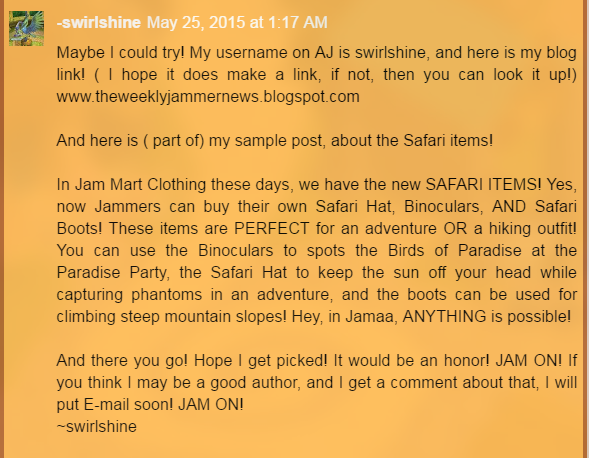 You guys: Stap it Swirl just post. Ah, how I missed these little dialogue intros! XD! Anyways, how have you all been!? I've actually been rather well, despite this week being a testing week. Guess what? I'M NOT GOING TO SCHOOL TOMORROW!!! Well, okay... technically I am. I'm just not going to any of my classes, because... my whole choir's going to our UIL performance! It's at another school, and we take a bus there, but we're meeting in the theater teacher's room to put on our choir outfits. Sadly, we have to wear dresses (I hate dresses because I hate being fancy. I'm NOT fancy. Why would I try to be? ), but they're actually kinda comfortable. We're gonna be gone the whole school day. First, we're gonna perform these 3 songs, and then we'll sight-read. I rather hate sight-reading, but i do love singing! We've been practicing for months, and since we're judged (whyyy), I really hope we do well! After that, we go to Peter Piper Pizza for 2 hours and eat and do whatever the heck we want (well, not WHATEVER we want, but... y'know)! I'm excited for that part! However, I'm missing quite a few quizzes tomorrow, but they shouldn't be too long to make up on Thursday! So, we've been singing a really beautiful song in choir for UIL. Our teacher promised she would tell us the meaning of it today, and, well, she kept her promise. It was a really sad meaning, actually. Like, REALLY sad. I won't say what it is though, because... well... uh... I dunno who else could read this someday and be traumatized, so... yeah. Anyway, she told us today, and... uh... there were a lot of kids crying. Honestly, even my choir teacher was, because it reminded her of something sad that happened to her. I don't know if I've told you guys this yet, but I feel VERY awkward when people around me are crying. Actually, no. Crying in general makes me uneasy. Even the WORD crying makes me wanna just change the subject. I rarely say the word crying. VERY rarely. But, yeah, I feel like I'm heartless sometimes, including today, because of that. I don't even think I LOOKED that sad. I just felt it on the inside. OH MY GOSH YOU GUYS. I JUST CAN'T WAIT FOR THIS ONE JM THAT'S COMING UP SOON!!!! It's gonna be such an EPIC CHAPTER, you guys! AHHHHHHHHH!!!!! Sorry guys. I'm just VERY excited. VERY. EXCITED. I'M POSTING ABOUT AJ NOW. It's an AJ blog. I need to post about AJ things. So let's do that right now!!! Well, this is what I found. ... and the same paw prints in the snow and claw marks on a rock wall in Mt. Shiveer. But what animal could it be? An arctic fox or wolf? Nope, have those, too, and their paws are too small as well (at least the AJ ones). A snowy owl? A lemming or rodent of some sort? 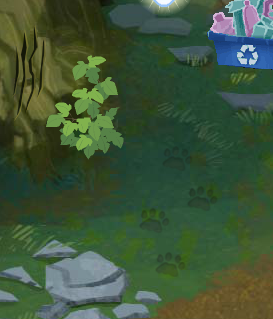 They're paw prints, and much too big to be any of those. Plus, the clues were in the FOREST, too. So what does that leave us with? Well, my mom and I thought about it, and I even looked it up to make the idea she had was true. So, I think the new animal is... a WOLVERINE! 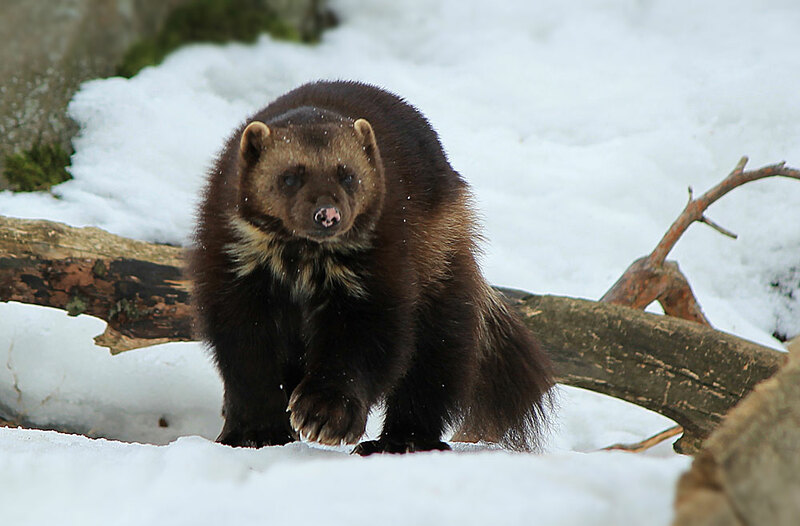 Rather cute, if they're not snarling or growling or baring their teeth or anything. Sadly, that's about it for now! I'll be using my new schedule soon, and I'll be posting comments a day after they're sent in, too, like I should! I've barely been posting anymore! I guess it's just because not too many big events have been happening IRL, but what about it AJ? I need to start making more posts on the game. 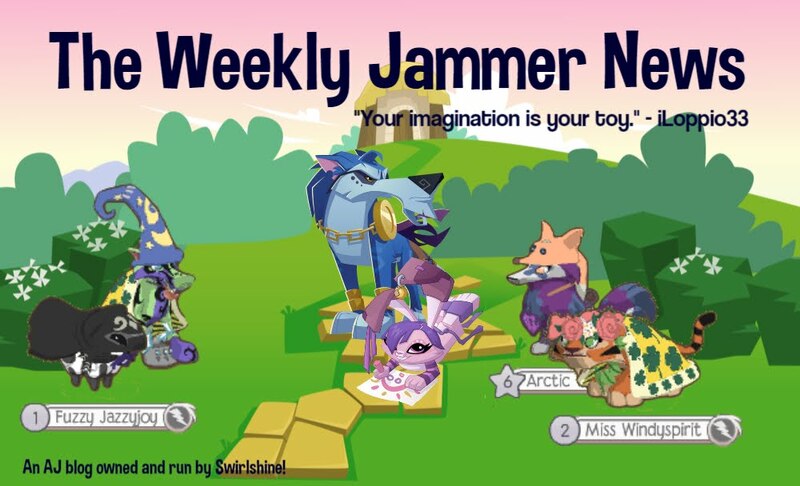 I mean, it IS an Animal Jam blog, right? Oh yeah! JM is now up! I'm sorry about it being late again as well. I honestly meant to yesterday, but then I forgot somehow. I honestly hate myself for not posting too much anymore. So... I'm gonna try out a new after-school schedule, so that I have more time on the computer, which means MORE POSTS!!! YAY!!!! I'm gonna do my homework earlier now, so that I can get on the computer faster. My homework is usually done at night, kinda late, and if I have a lot of it, it sometimes means no computer time for Swirl. Most likely, though, that will all change with this new plan! Hopefully it'll work out! However, we DO have CA tests this week. I'm not sure if this particular week will be a success, but no worries! I'll try anyway, and there's always next week! Sorry if that sounds rude in any way! Okay, so that was awkward. Anyways, today, I have a story to tell you all...about tonight. Well, I'm posting this after midnight, and you guys will see this tomorrow, so I guess you can call it yesterday. Whatever it is. Let's just begin. Okay, so, tonight, there was a tornado warning. A literal TORNADO WARNING!!! I'm terrified of all natural disasters. However, the only ones that really occur where I live are floods and tornados. But tsunamis, earthquakes, hurricanes...they're are deadly. So therefor, I'm scared of them. But not just scared. TERRIFIED. I'm not kidding. Tornados make me insane with fear. But anyways, I heard there was a tornado warning, which means that someone actually SAW a tornado somewhere close by. So, being my natural, freaked-out self, I literally said "Bye", then grabbed my computer (with my headphones attached), computer charger, phone, Eevee stuffed animal, and my favorite LPS, and went into our laundry room. Our laundry room has no windows or glass, so it's basically the safest room in the house, seeing as we have no basement (but do any houses nowadays?). So yeah, I went and hid in there. Along with my things I had brought. I brought my phone because, well, I'm not getting another one if it gets destroyed, my LPS and Eevee because I LOVE THEM SO MUCH, and lastly, my computer, because...well... it's my only link to you guys. If I lose all my electronic devices, then I don't have any way of posting, playing AJ, or reaching you all ever again. My computer is the closest thing I have to my Blogger friends, and if I go down, my computers goes with me! But yeah. I hid in there, along with a pillow to cover my head, just in case, until 11:45. Unfortunately, about 10 minutes before 11:45, my dad yells "Oh, now there's a tornado warning until 12:45!" And I literally lost it and screamed with rage, because I was not planning on moving out of the laundry room (not to mention out of my fear zone as well) until the warning was gone. However, he turned out to have been kidding, and I was very triggered and told him so. Hehe. Sorry Dad, but that's NOT a funny prank in my mind. By the way, the whole time I was in there, I was preparing and freaking out about how I didn't want to die. So there you go, peeps! my short story of insanity! Sorry I can't make this post longer! My mom wants me off the computer soon, sadly. But I CAN try to post tomorrow, so (hopefully) see you then, everyone!!! I'm so sorry guys! I'll post JM tomorrow, because I don't have much time on the computer today. I'll also take the time to make a proper post and get back on track- I promise! Sorry for not posting it yesterday, you guys! I meant to make a post saying so, but I forgot! I just didn't feeling like writing yesterday, that's all. Also, very sorry for the inactivity. This is the last week of basketball, so I'll have more time on my hands very soon! Hope I can see you guys and reply to your comments tomorrow! I'll certainly try! 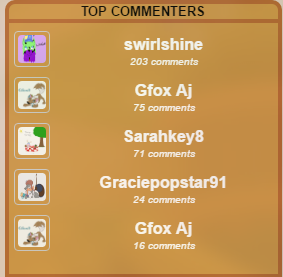 I COMMENTED 200 COMMENTS!!!! I THINK I WON IT, YOU GUYS!!!!!!!! I did win it, right? I don't want to sound all awkward if I didn't actually win yet. Also, I do not mean to brag. Yes, it's me, back for the second time today! I had two ideas for posts, and, after asking Lostfairy, who I met up with today, we decided on doing BOTH of those posts today! Now, this post is a little different than most. It's pretty much an apology, in a way. You'll understand soon, I promise. That's enough of my awkward intros for now. Let's get on with the post. Alrighty...so, in this post, I'll be reacting to...well, me! Or "Old Swirl", as I like to say. Be warned, it's...uh...odd. Okay, so here's where the story starts. 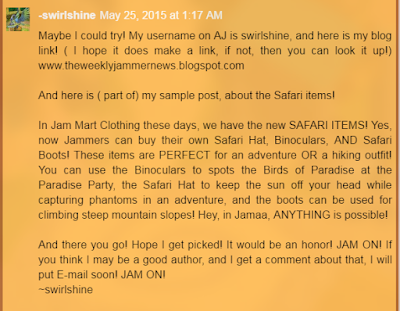 I loved blogs just as much as I do now back then (a few years ago), and, seeing that the Animal Jam Community Blog was hosting author tryouts, I decided to apply for the job. Nowadays, I realize that I wouldn't have had time for it anyway, and there's a lot of other things I didn't consider at the time, but remember, this WAS Old Swirl. WHAT ON EARTH IS THAT!!!!????? All that was just about JAM MART CLOTHING ITEMS!!!! I literally typed like I thought no one knew the new items in stores by then. I mean, a lot of other blogs do that already! I'm not saying that's bad, I'm just saying that it was pointless for me to write about that. But those were my old posts, and I thought it was good at the time. For some reason. So yeah, happy little Old Swirl sent that in. And then, after a day or two, she gets... DA DA DA DAAAAA! HER FIRST HATE COMMENT!!! Haha. Well, at least THIS hater can spell and use SOME punctuation! Actually, the first part of of this right. I DID type like I was an author on the DE, and it WAS annoying. Seriously. It's even annoying to ME! I know you guys probably don't think it's annoying, but I do. Anyways, as Old Swirl, I saw this and thought "Wow, a rude hater with no life" and didn't really care that much. But boy...oh boy... was I sure mixed up. Yes. I did that. I literally acted sad over it, when I WASN'T. And who APOLOGIZES for that to a HATER!!?? Yes, I did. But I can explain. I didn't post those 2 replies because I felt like tricking people or lying. I posted them because I wanted people to stand up for me. I'm not kidding here. Little me wanted friends so bad that she decided to act sad and hurt by a hater who's comment wasn't even that hurtful. I wanted to see who would stand up and be kind. A while later, maybe about a year, I wrote this in the comments when the AJC hosted another author tryout. And I still acted like that. For attention. I actually DID end up having plenty of people do what I wanted in the first tryouts, and stand up for me. I liked it, and was very happy about that, but none of that is the point. The point is, I'm sorry. I basically lied and used my friends back then, and I apologize. I'm not proud of Old Swirl. Not at all. If I could go back in time, I wouldn't have posted those "I'm sorry...maybe I should leave..." comments. Heck, I don't think I would've posted anything at all. Just ignored. But, sadly, I can't change what's been done, as of right now. All I can do is apologize a gazillion times. All this may not sound very rude to you guys, but to me, it was an all time low. Please know that I'd NEVER do anything like that nowadays! That was Old Swirl. 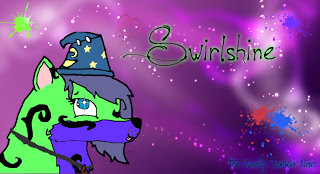 I'm the NEW AND IMPROVED Swirl now! The Swirl who actually KNOWS how to deal with haters and friends. For the very last time, I'm sorry, and I hope you don't think negatively of me after reading this post. In the meantime, please remember to PARTY HARD, BE STRONG, and JAM ON! Oh, and don't be like Old swirl! Please! I posted Jamaasian Middle, Chapter 9, on Friday night. I thought it was Saturday. Anyways, today, I'm back to post more of my art that I've drawn! You all seemed to enjoy those kinds of posts, and so do I, so I decided to make another! OUR LOVE AIN'T WATER UNDER THE BRIDGE!!!!!!!!!!!! Oh my gosh you guys! It finally finished uploading!!! YES!!!!! Alright, enjoy! I've got a lot of Warriors pictures, so for you non-Warriors fans...uh...just enjoy my kitties! XD! I drew this one a while back, actually, and now it's hanging up in my closet! The "Better In Stereo!!" part is from a Liv And Maddie song, hehe. I've decided that my wolf's swirls will now be drawn (by me) in a specific way, so this is my reference picture, XD! Okay, so, I really love Crowfrost. He's a minor character in most of the Warriors books, but, in "A Vision Of Shadows: Thunder And Shadow", he's actually very important! He's a ShadowClan cat, so it's rather odd that I like him, though. No, I'm not like others, who think that all of ShadowClan is evil (although they have produced quite a few villains...). I just don't care much for them since they kinda have this attitude. Seriously, they could all be on the brink of death, and they'd just be like "Nope, everything's fine! WAIT...WHY DO YOU WANT TO KNOW, HUH!!?? YOU THINK OUR CLAN IS WEAK, DON'T YOU!!?? WELL WE'RE NOT!!!!!! WE'RE STRONG, AND WE DON'T NEED HELP!!! EVER!!!!" However, they actually DID ask for help in this book. And Crowfrost was trying his hardest to help. 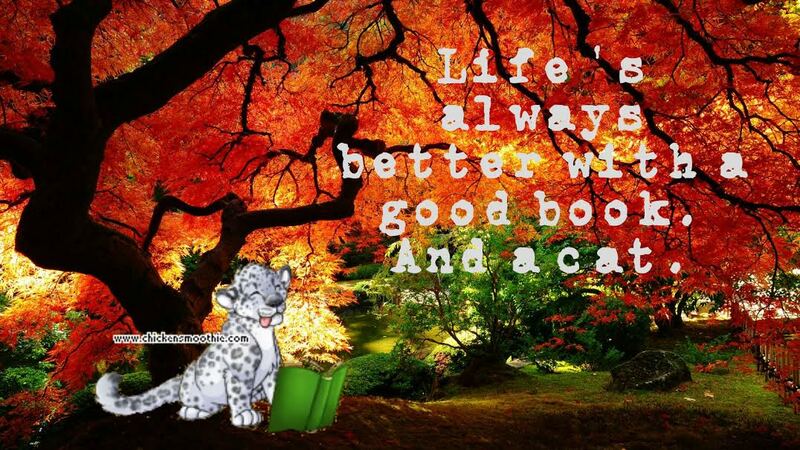 He was actually rather kind, and basically THE ONLY SMART CAT left in ShadowClan. Until THEY KILLED HIM OFF. I'm not kidding! They killed him! ShadowClan cats were dying because of a sickness. They finally got the herb they needed, but, apparently, Crowfrost 'was too weak to respond the the herb' and died. HE DIDN'T EVEN GET A DEATH SCENE!! THEY JUST BRIEFLY MENTIONED IT!!!! GRRRRRRRRRRRRRRRRRRRRR! Okay, my rant is over. Sorry. Moral of all this: Crowfrost is cool and I like him. Ah, this one. Those are all people I know as cats. From left to right, it goes Dancer (calling them by their JM names for privacy reasons), with Cat on top of her head (her NAME'S Cat, but yes, she is a cat too), then Ella, Emma, and Raina. And the silhouette? That's me. It's supposed to show them all walking away together, leaving the me-cat out unknowingly. No, I DON'T still feel this depressed. Here's Snowfur, now a member of StarClan, watching Thistleclaw, a Dark forest warrior, from across the StarClan/Place of No Stars border. I know you all probably can't see Snowfur well in that first pic, so here's a zoomed-up one for you! 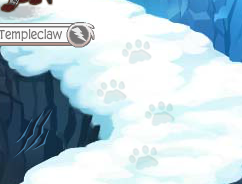 And a zoomed-up shot of Thistleclaw, too! From left to right, Lionblaze, Dovewing, and Jayfeather, from "The Power Of Three"! And finally, a little custom kitty with magical powers I randomly created! Her name's Saturn, because...well...because of that Warriors MAP. Well, that's all I've got for this post, my friends! Remember to PARTY HARD, BE KIND, and JAM ON!!! !